Description: In the days of Roch’s childhood, winters in the village of Ste. Justine were long. Life centered around school, church, and the hockey rink, and every boy’s hero was Montreal Canadiens hockey legend Maurice Richard. Everyone wore Richard’s number 9. They laced their skates like Richard. They even wore their hair like Richard. 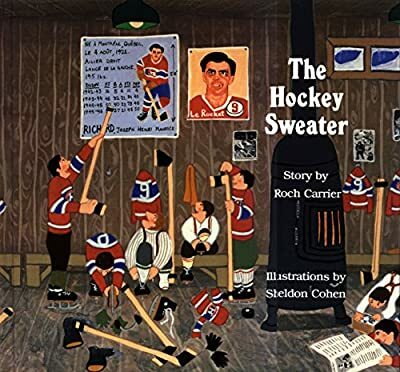 When Roch outgrows his cherished Canadiens sweater, his mother writes away for a new one. Much to Roch’s horror, he is sent the blue and white sweater of the rival Toronto Maple Leafs, dreaded and hated foes to his beloved team. How can Roch face the other kids at the rink?